Khazad-dûm transports you to the ancient realm of the Dwarves with 165 new cards (with three copies each of its player cards), including new scenarios, encounter sets, heroes, allies, attachments, and events. Visit the official site to learn more about this exciting deluxe expansion! This is not a stand-alone expansion. A copy of The Lord of the Rings: The Core Set is required to play. 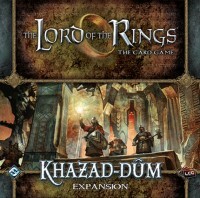 Khazad-dum is an expansion for the Lord Of the Rings Living Card Game. You must have a core set in order to play. This expansion has 3 scenarios in which you are going to Moria to find out what happened to Balin. Dwarfs and lots of them! There are several dwarf characters to make it easy to play this quest with an all dwarf cast. Dwarlin (new hero) after destroying an Orc lowers your threat by 2. Bifur (new hero) can have other players provide him with a resource. There are Dwarven attachments and events. Some of my personal favorites are: Durin’s song is an event which provides a dwarf hero with +2 questions, +2hitting, and +2 defense until the end of the round. Khazad! Khazad! which provides a dwarf character with +3 attack until the end of the phase and best of all its cost is zero. Erebor Record Keeper an ally allows you to play one lore to read a dwarf character. Scenario 1 is entering the mines. You are entering moria to try to find out Balin’s fate. It is required that your group go past the east gate,first hall and bridge of khazad-dum before you can actually start questing. Be sure to bring as much questing power as possible. 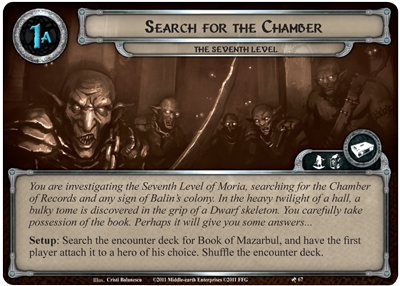 Scenario 2 is where you search for the chamber, and read the book of Mazarbul. This is a much easier scenario than the first and third one. Scenario 3 is entitled a Presence in the Dark. This scenario can be very easy or difficult depending on how the cards play out. At the start of the game when you are creating the quest deck you will notice that there is a large number of #2s. These are shuffled and placed face down after your first quest. Depending on what you pull you could have a very long way out of Moria or a very short one. I was very luck the first time i played, I got the abandoned tools and the quest that allowed me to use them to escape. The second time I played I was lost in Moria for a long time. What I think: I think this is a wonderful expansion. I enjoyed playing with totally new characters, attachments, and each quest has some new idea which makes the game fresh. In the final scenario the nameless fear’s threat is the number of victory points displayed. So as you successfully quest and kill Orcs, your questing becomes more and more difficult. In other words, by being successful you may become unsuccessful in questing. Go quickly and run across the bridge to leave, or the long dark of Moria will swallow up your crew of dwarfs making it impossible to face the nameless fear. If you are playing the Lord of the Rings Living Card game this is a welcome addition. Add a Review for "Khazad-dûm Expansion"